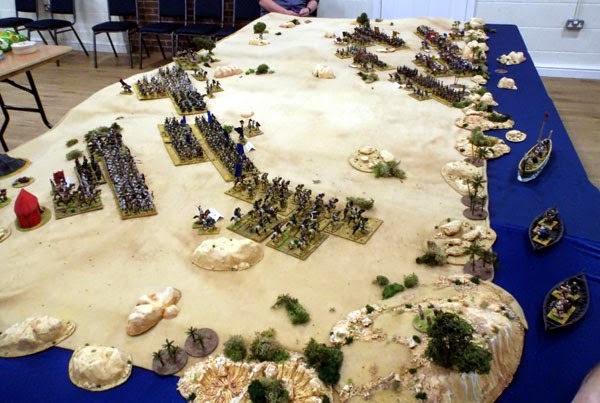 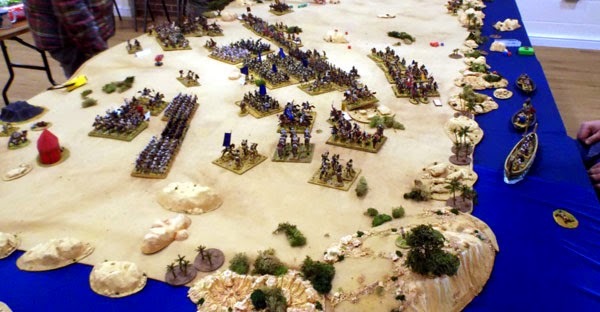 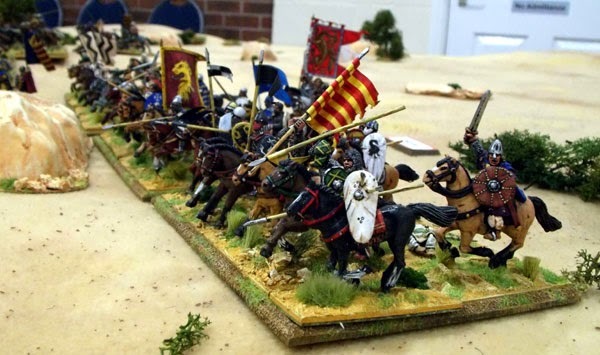 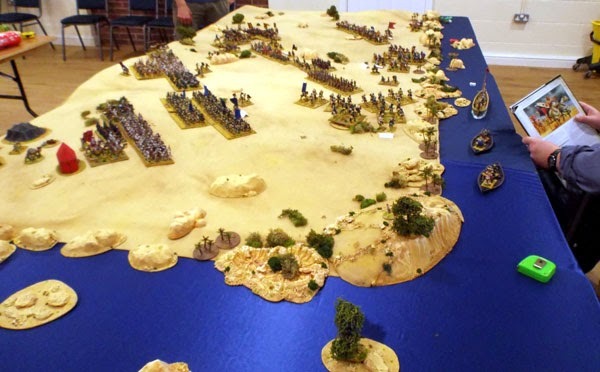 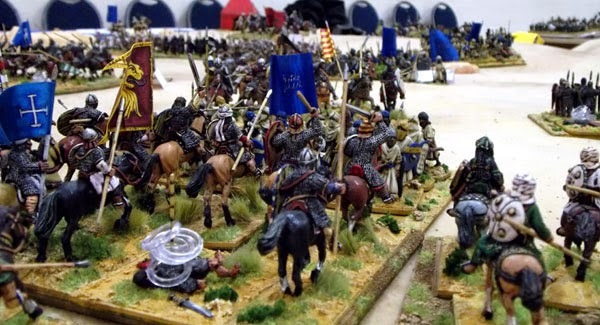 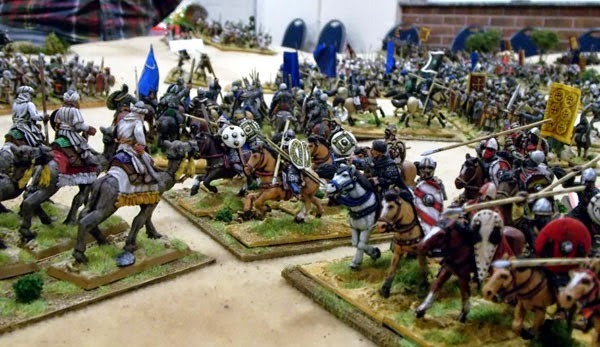 When I sit back and imagine a fitting send-off to a year's gaming, I imagine a table groaning with miniatures, fantastic scenery, convivial company, simple fun rules, a well thought out scenario and maybe a few choice snacks to accompany the fun. 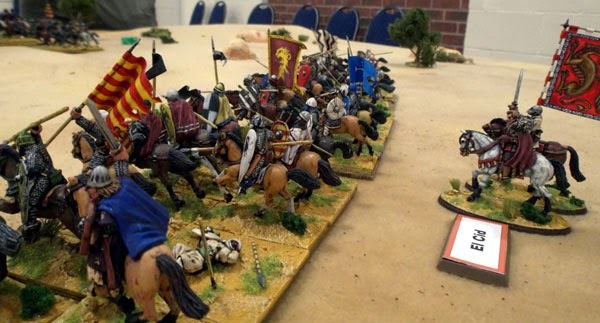 Well I must have been a very good boy this year, because that's exactly what I got! 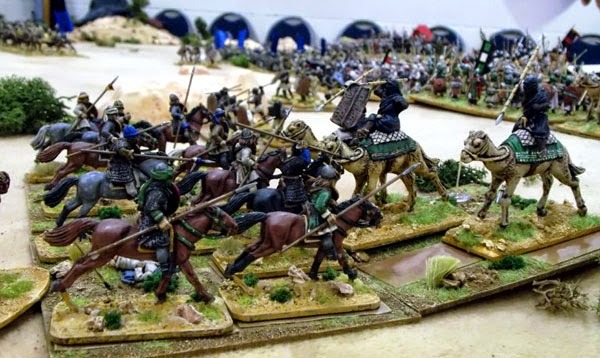 Scrivs, James, Steve and myself assembled at the Bowls Club to re-fight the battle of Bairén using James and Scrivs enormous El Cid collections (with a few of my soldiers for good measure). 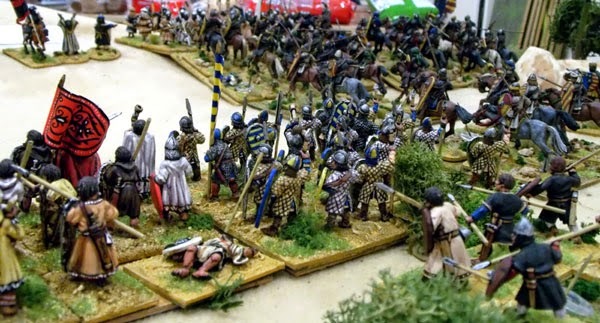 We had toyed with fighting the Crusades scenario from the Hail Caesar rulebook, but found ourselves sadly lacking in the Ghulam department and in need of more Turcopoles than the average man possesses. 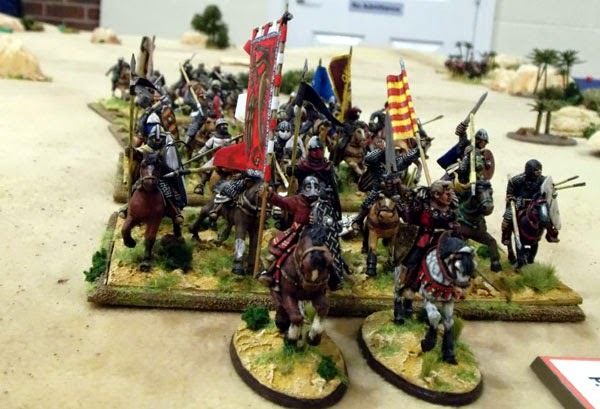 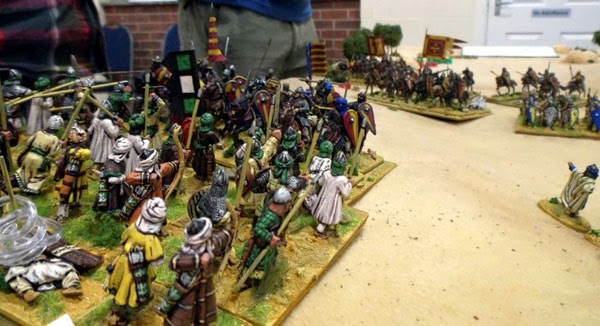 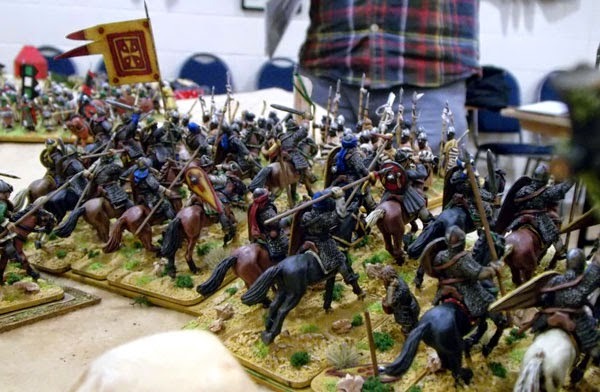 Fortunately James is a fount of all knowledge regarding El Cid and came up with a scenario based on one of his battles that involved a narrow peninsular, archers in boats, the Cid and a host of other worthies of the period. 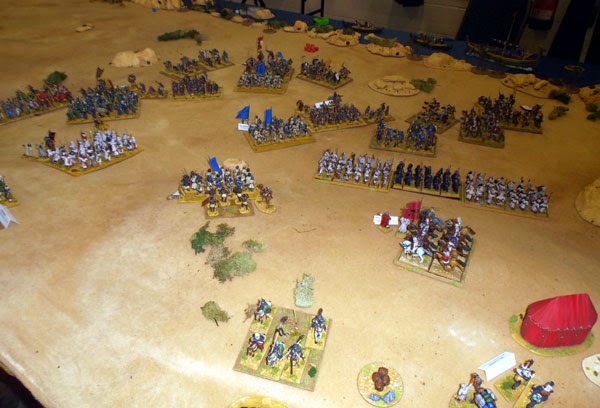 I was to command the Almoravid hosts, ably assisted by Ibn Scrivs, whilst James took the role of the Campeador with Steve as his brave lieutenant. 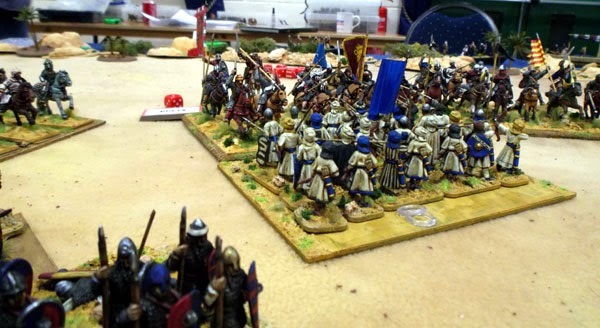 I took loads of pictures, and here they are along with a small commentary on the action. 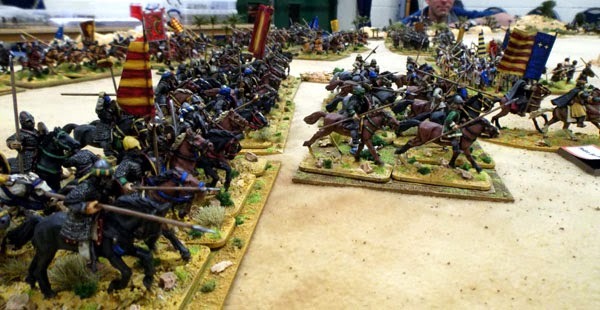 The scene that greeted me on my arrival! 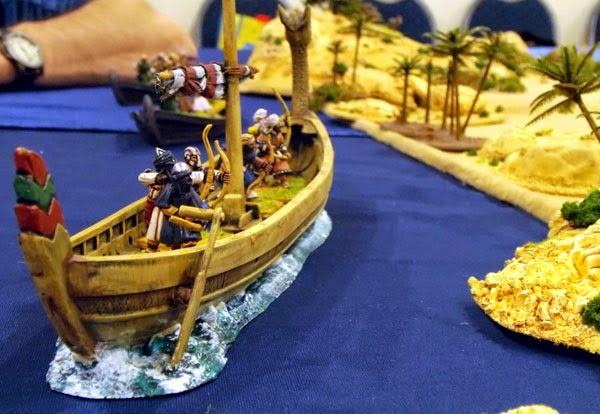 Gunboat diplomacy - 11th century style. 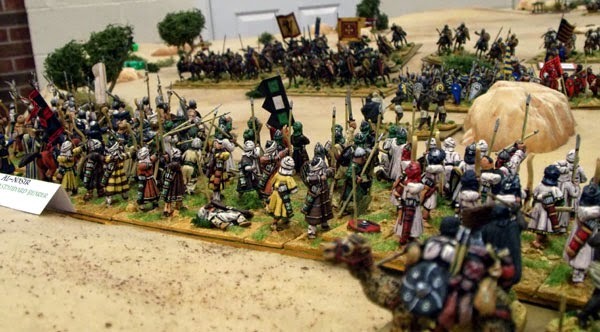 The view of the distant infidels. 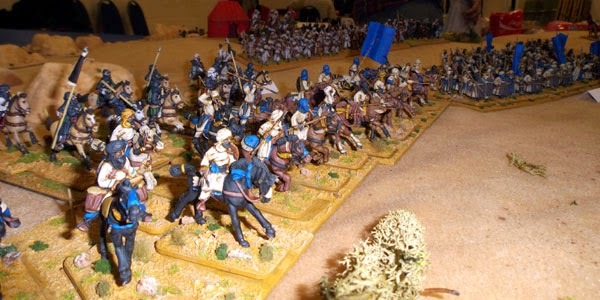 The battle began with an advance by the Christian forces, which we countered on our right with a large division of light cavalry. 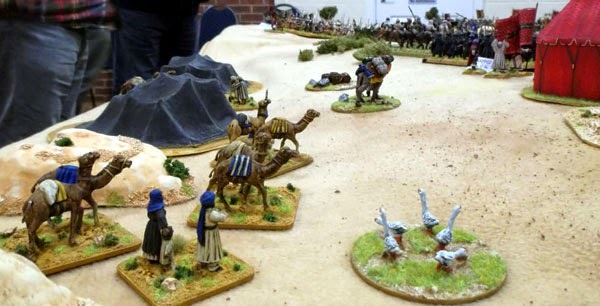 Forward the Camels of Allah! 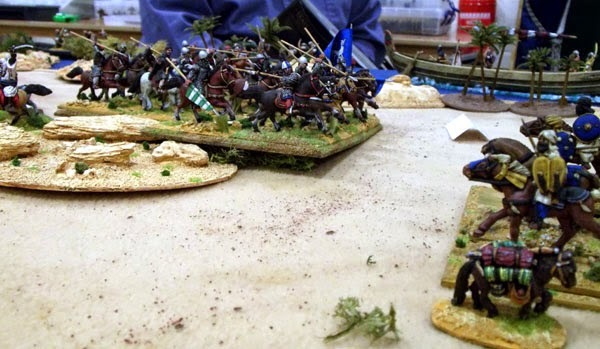 The Almoravid boats cruised the coast, scattering (largely ineffective) bow-fire at the Christian forces.In the centre the lines slowly closed on one another, and eventually Christian horse contacted the left of the Almoravid line. 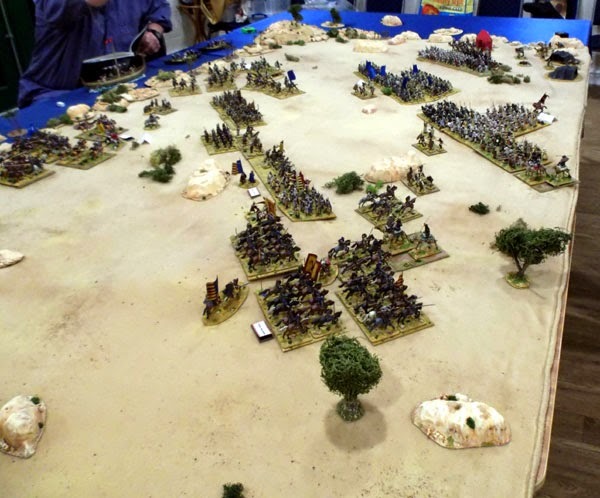 The Berber reserve, maintaining their reserve. 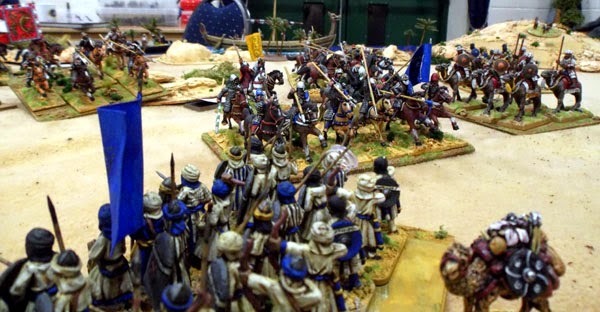 Rodrigo Diaz led his knights on a sweeping move toward the Almoravid right, before switching to attempt to punch through the centre. 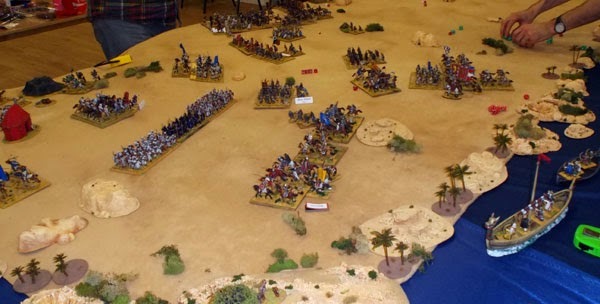 However the Berber spears threw back his charge and drove the Cid back toward the coast. 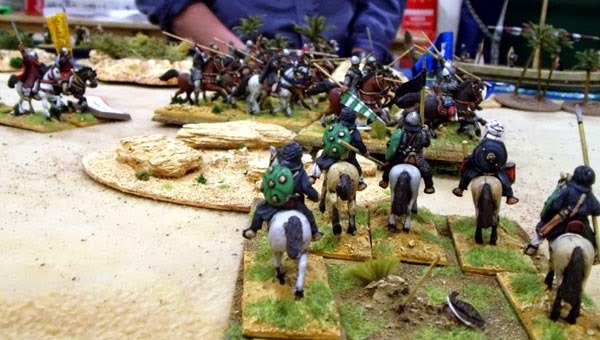 Rodrigo leads forth the flower of Christian chivalry. 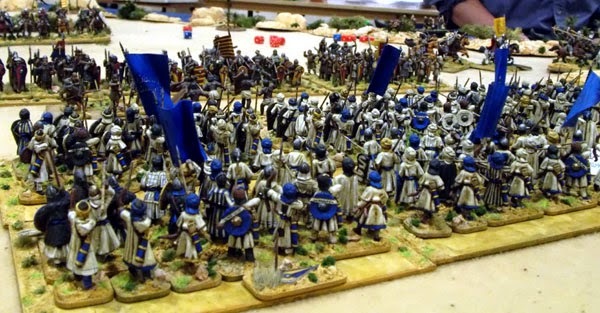 Goats. 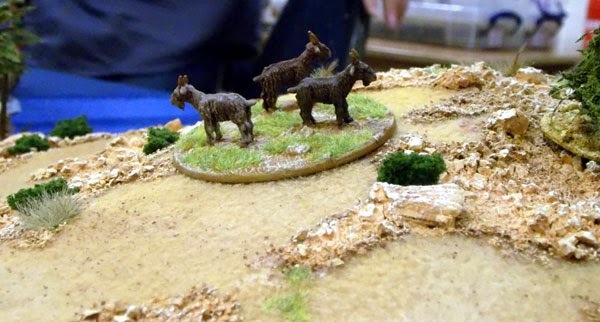 Steve kept suggesting they were terriers. 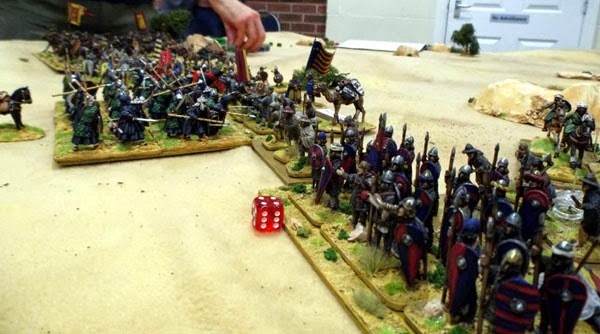 Somewhat unkindly I thought. 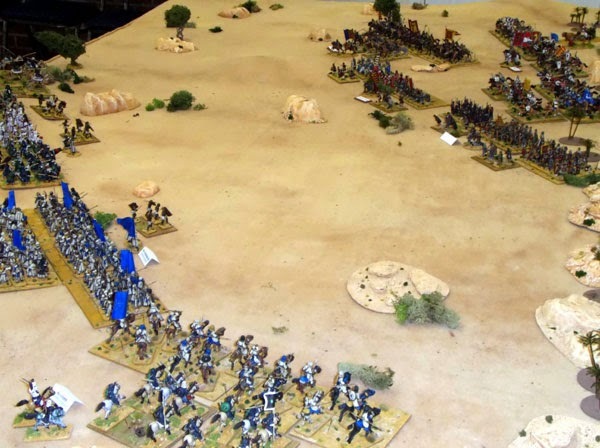 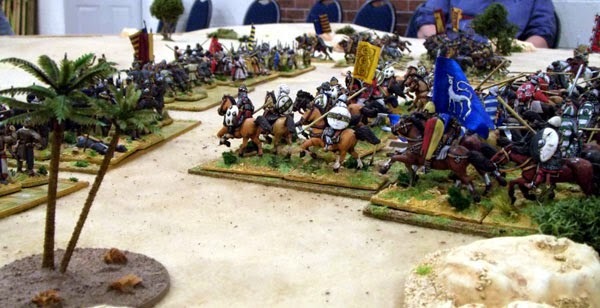 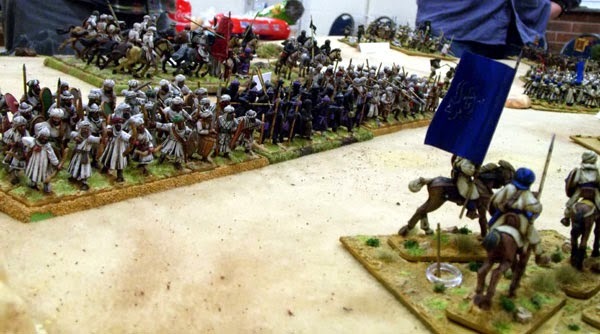 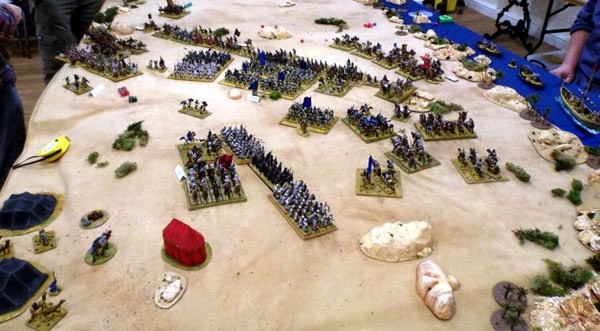 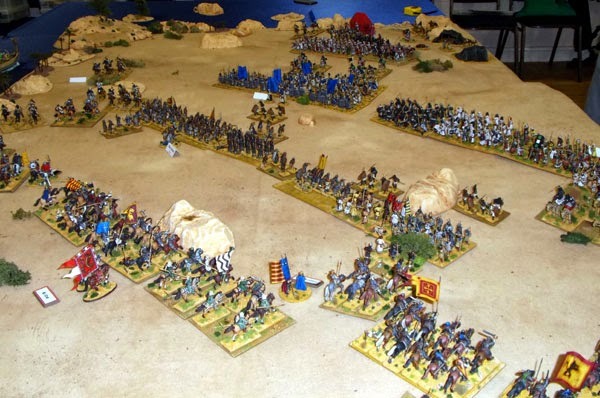 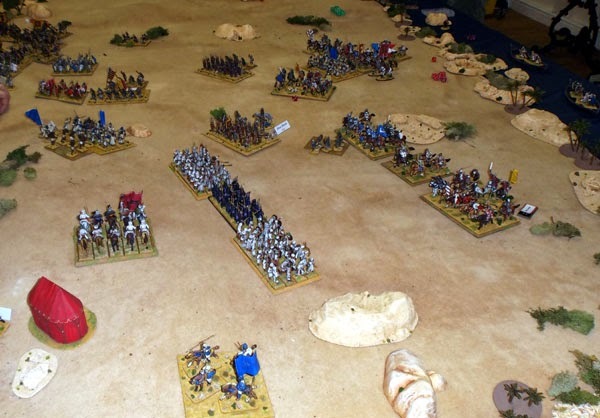 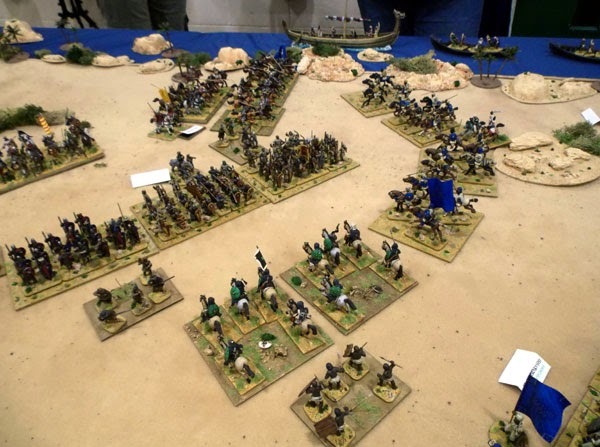 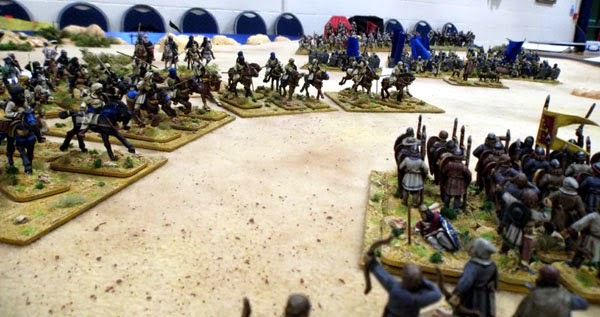 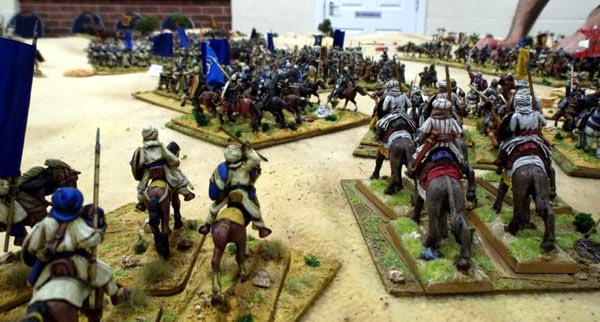 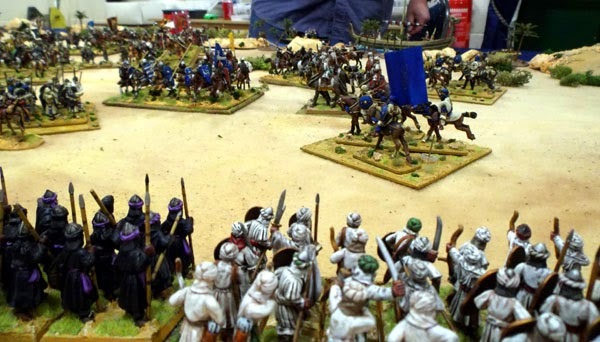 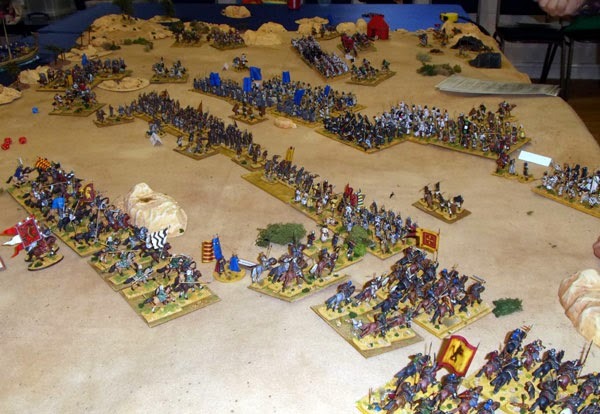 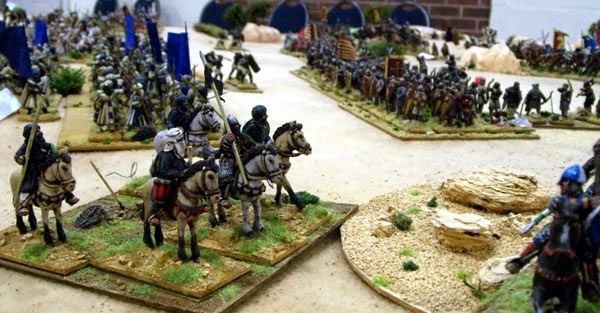 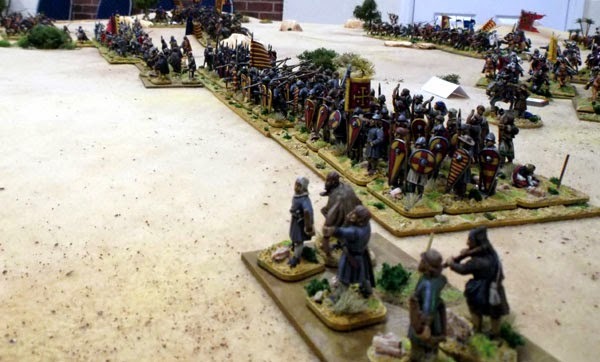 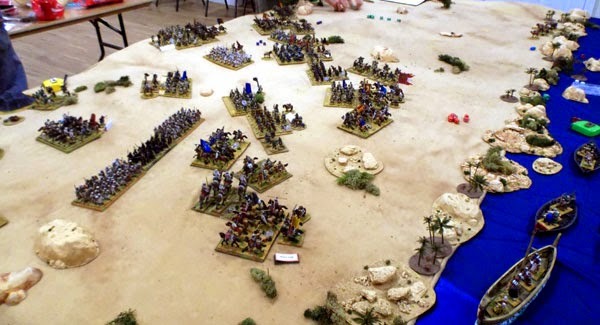 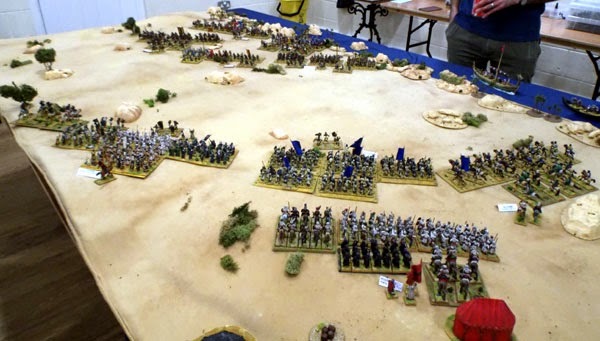 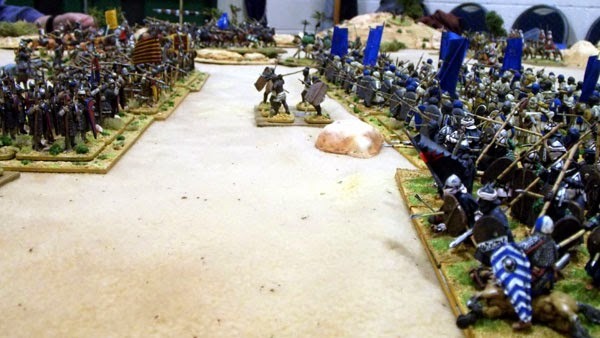 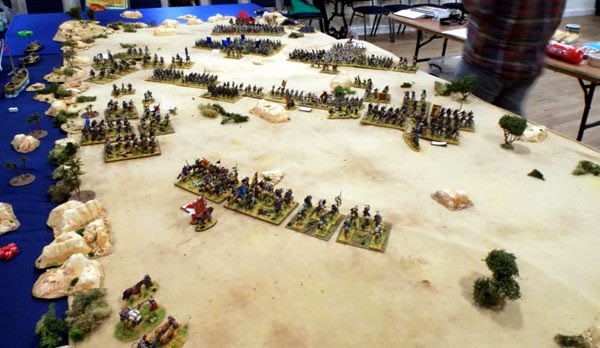 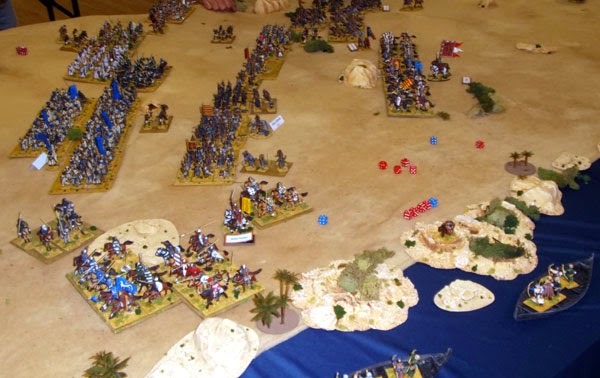 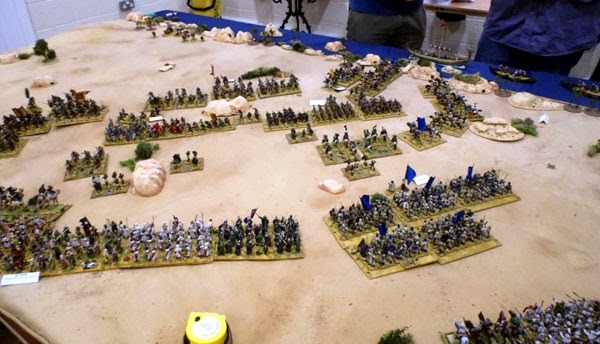 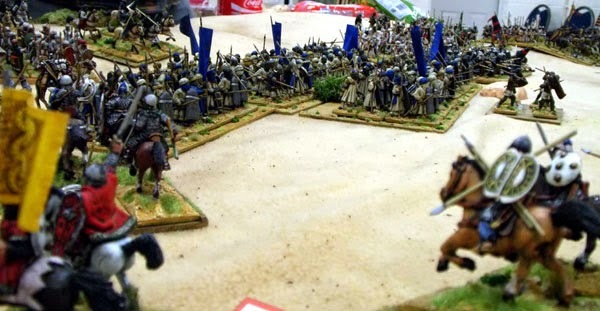 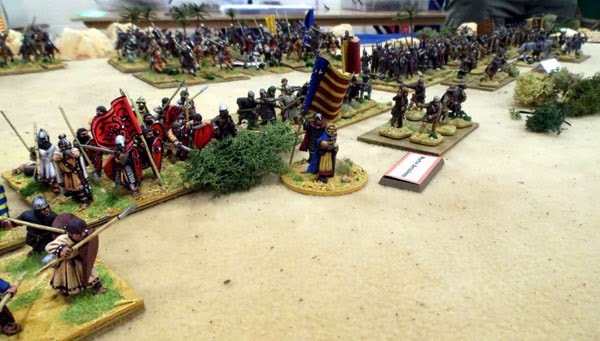 On the right the knights broke through and the Almoravid reserve rushed to plug the gap. 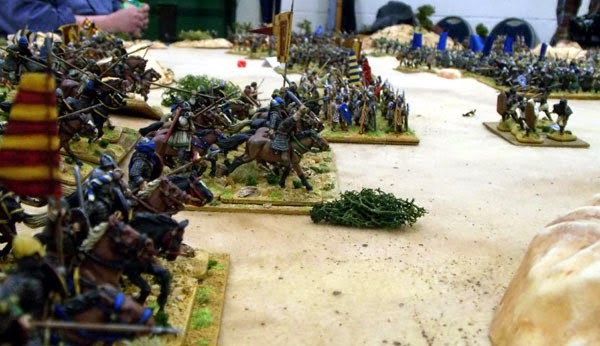 However casualties were beginning to tell on the Arabic forces. 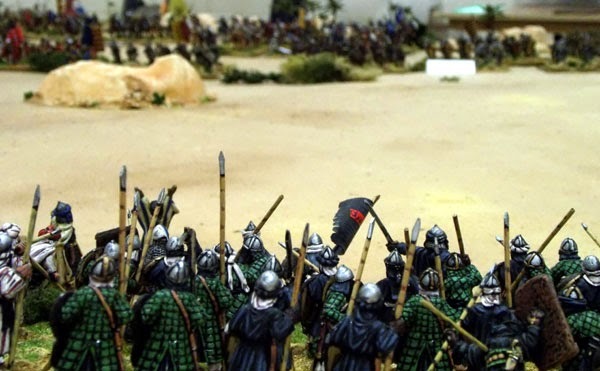 Eventually the Christians broke the Almoravid army, but with their final spear thrusts the spearmen were able to unseat El Cid before retreating from the battlefield. 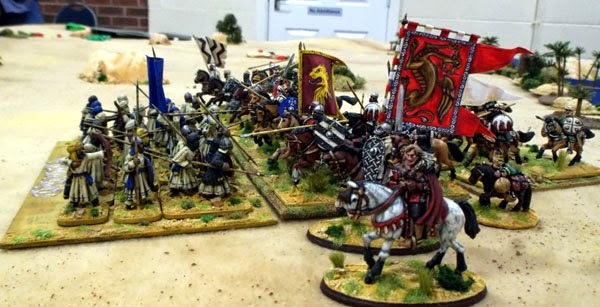 And so the battle ended with the Almoravids in disarray, but the Campeador lying bloodied on the ground. 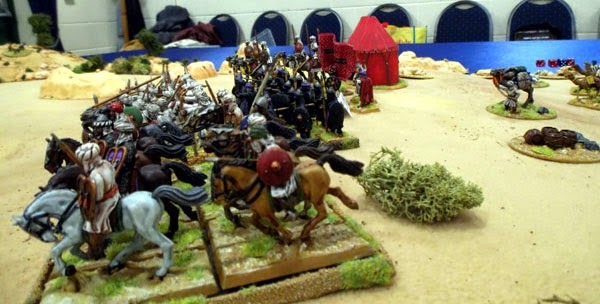 And a great time was had by all. 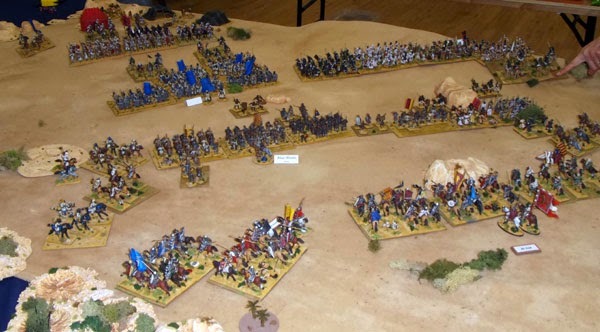 I think Steve found the levels of abstraction of Hail Caesar a little baffling (he's an Armati man at heart) and we hadn't played for around eighteen months, so were winging it with quite a few of the rules, but when it looks this spectacular and the company is so good minor rules details are a mere trifle that need not concern us. 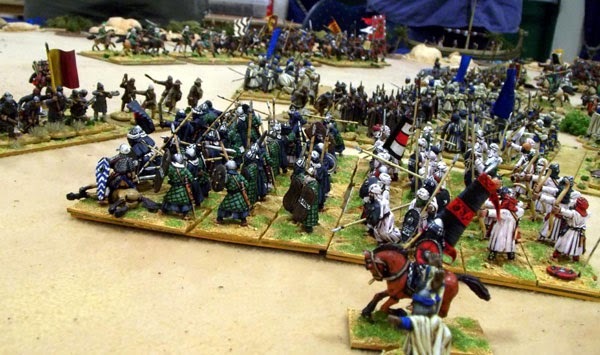 Scrivs version of events (and more photos besides can be found on the Scrivsland blog.